We could not have been luckier today; it was dry, warm and the winds were calm. The “dry” was really important for this first stage of our project as even a small rain event would have caused a significant discharge from the stormwater pond into the stream where we planned to work. Also, the coir logs, seen below, while fairly light when dry, are quick to wick up moisture, making them pretty unwieldy when wet! 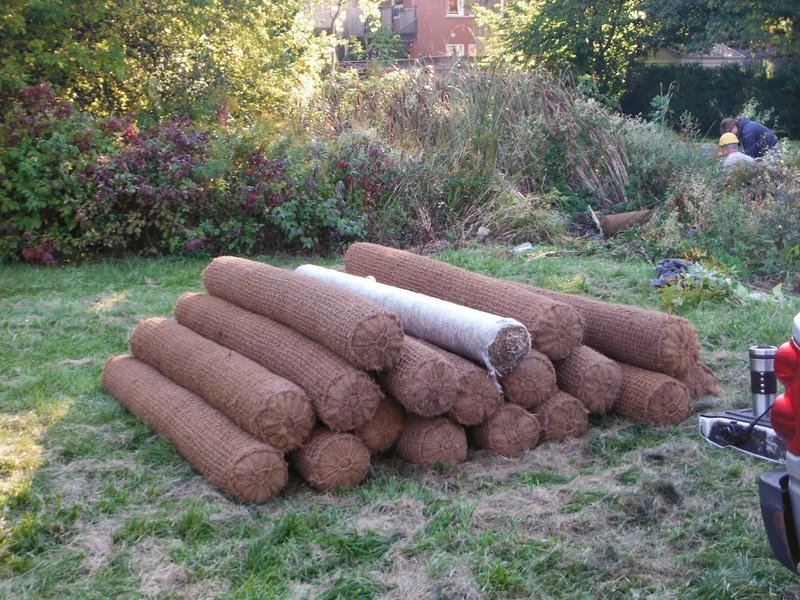 The coir logs were delivered early to the site, and neatly stacked by Rehill Building Supplies staff. 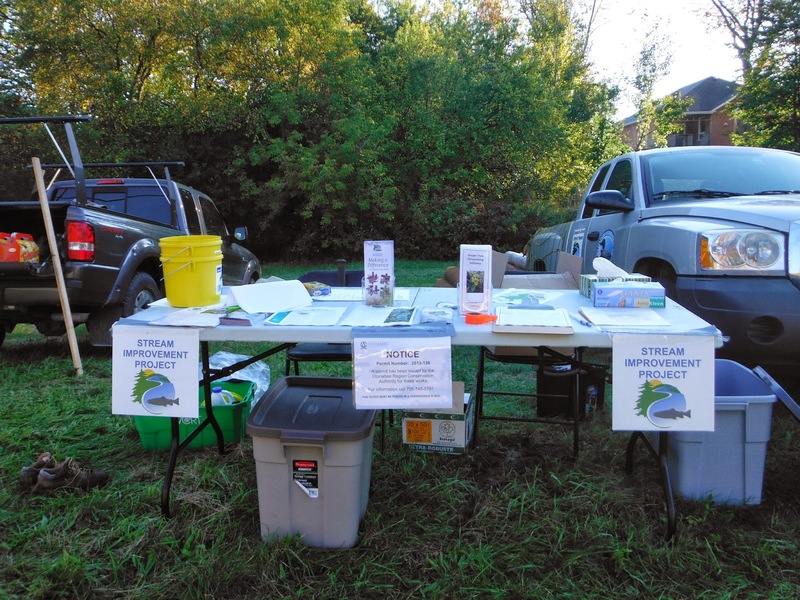 As volunteers began to arrive, our table was quickly set up and covered with educational materials on native plants, stream health and brook trout. The CSSP “Stream Improvement Project” signs easily communicated to passers-by what all the hustle and bustle was about. And right from start we had curious neighbours with fantastic questions stopping to chat. An adjacent homeowner decided to don a CSSP T-shirt and join the team for the afternoon. 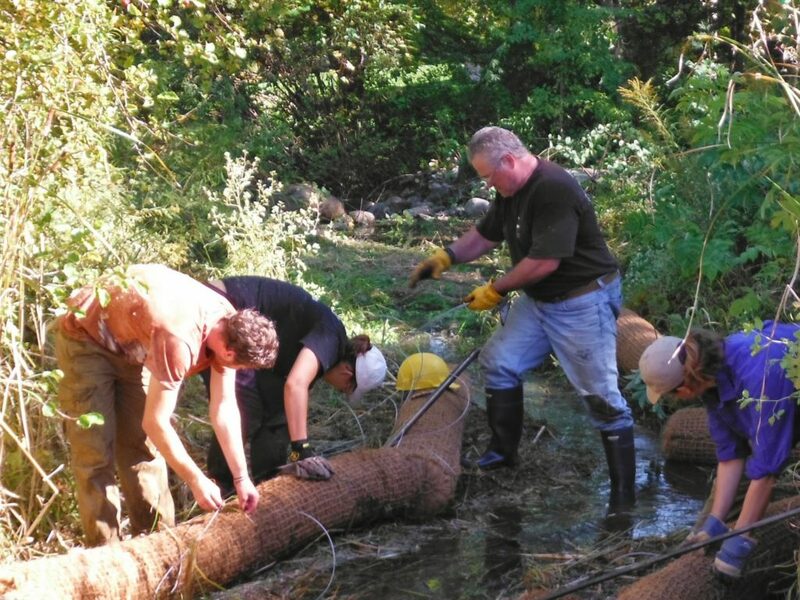 This kind of community engagement is invaluable as our friends and neighbours have gained a better understanding of the stream project, and can provide excellent feedback to the restoration team in the future. The table provided a great stage for conversation about the stream project, and lots of educational material was given out. Not long after we arrived, the City of Peterborough’s forestry team joined us. Experts at selecting and removing invasive trees, European Buckthorn and Manitoba Maples were soon quickly removed by this team of four, and fed through the wood chipper. 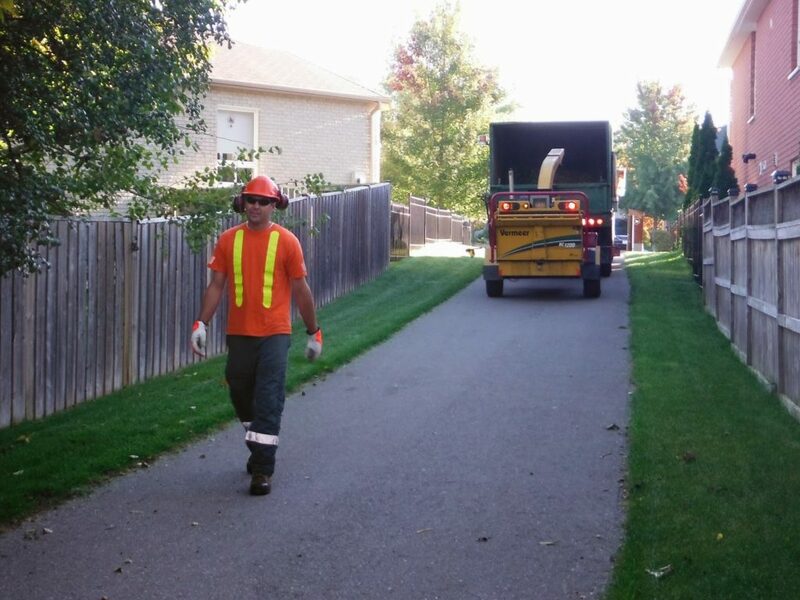 Scott Kellar from the City of Peterborough forestry department guides the wood chipper into position. Our work started with removal of stream side vegetation, primarily cattails and a plethora of buckthorn saplings. 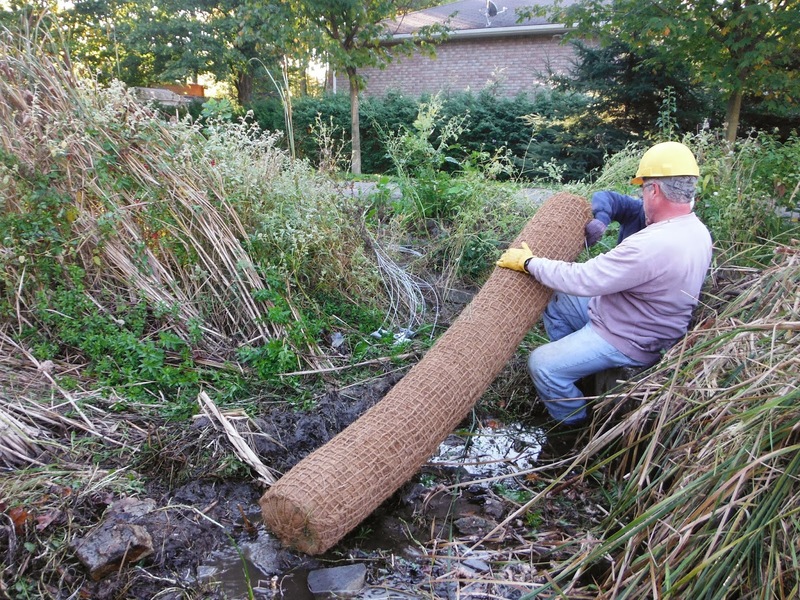 Once a small area was opened adjacent to the stream channel, the coir logs were anchored in place redefining banks for the stream that follow the creeks natural meanders. 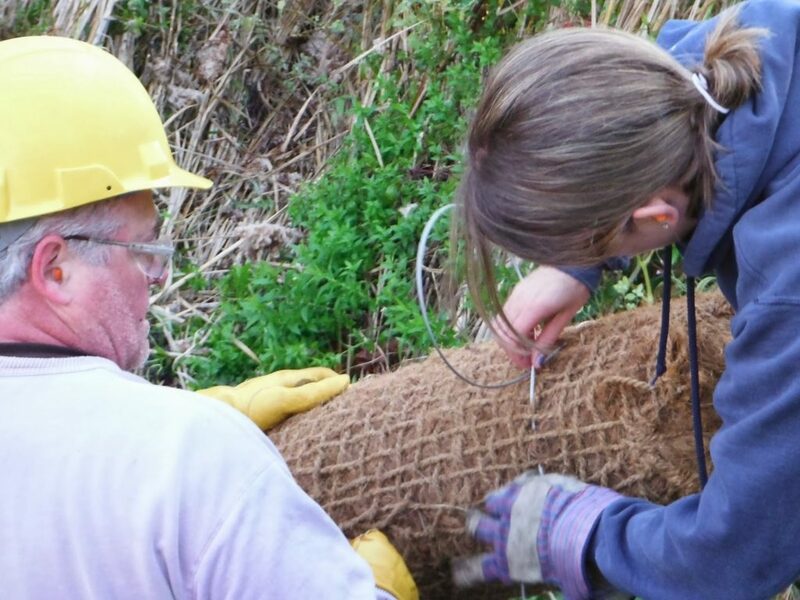 Lauren Sharkey, CSSP coordinator, and John Martin, HPSI volunteer, attach an anchor to the first coir log to be secured in place. The steel tether attached to the anchor must be carefully woven through the outer mesh of the log. The cable encircles the log twice and then an outer sleeve is crimped to prevent loosening of the line when it is introduced to the energy of flowing water. We hit our first snag when the steel stake used to drive the anchors into the bank broke off leaving the tapered end embedded deeply, still attached to the anchor, and not recoverable! The broken end was now too big to fit into the next anchor and so we had lost 50% of our team due to lack of a tool. Through incredible coincidence and good luck, J.B. Jaboor, Peterborough Field Naturalist, arrived on the scene. J.B. immediately whisked away the broken tool to a nearby friend who owns a lathe, only to return with the sad news that the rod was too bent to properly turn and it was the wrong material for his friend’s machine. Not to be defeated, our tenacious volunteer took it upon himself to grind the shaft down until it would once again fit into an anchor. Brilliant job J.B.! And so it was a happy ending and all of the coir logs, but the two saved for demonstration purposes (they will be installed tomorrow) were anchored in place today; a job well done by tireless volunteers! A straw erosion blanket was unrolled along the cleared stream side, and tomorrow we plant! Volunteers, Brian Ford and Jess Kroes (left bank) and Andrea Hicks (right bank) carefully position and fasten coir logs in place while John Martin (centre) balances on rocks within the stream in preparation for driving the next anchor. ← An Opportunity to Make a Difference: Our First Remediation Project!